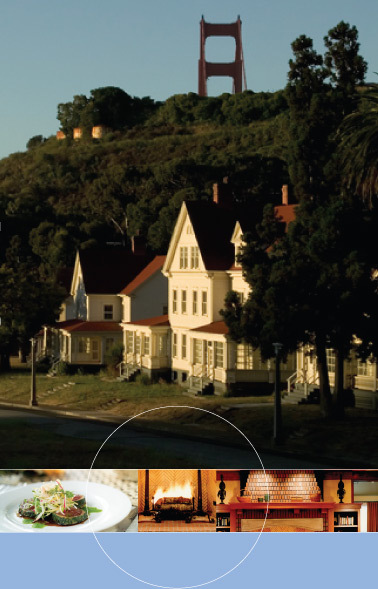 Scheduled to open in Summer 2008, Cavallo Point will welcome guests to the natural beauty of Marin County and the Pacific Coast, as well as the urban sophistication of San Francisco. In the tradition of America’s great park lodges and retreat centers, this facility will serve individuals, couples, families, and groups seeking a quiet getaway, connection with others, or experiential learning. Located on 45 acres, the facility will span centuries, with half of the 142 lodging units located in landmark buildings on the 10-acre parade ground – most offering sweeping views of San Francisco and the Bay. The other half will be 21st-century units designed for environmental sustainability, with commanding views of the Golden Gate Bridge. Cavallo Point will provide more than 15,000 square feet of meeting space, in many configurations, to host seminars, educational programs, and social and corporate events. Most meeting spaces will have fireplaces, and all will have beautiful views from tall windows facing the parklands. Both Cavallo Point guests and the public are invited to the 90-seat restaurant and bar/lounge and the Healing Arts Center, with 12 treatment rooms, a basking pool, and an herb atrium. Other amenities on the 45-acre property will include a wine and olive oil center, waterfront access, miles of recreational trails, and a historic bowling alley.